A 12% developer ration with STEAM FLAKED grains and added cottonseed hulls. Fortified with vitamins A, D & E. Contains proteinates of zinc, manganese and copper. 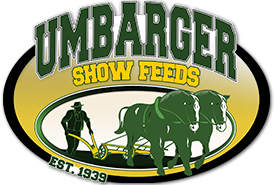 Breeder Grower is one of the most versatile of the Umbarger Show Feeds. Used almost universally as a creep feed or starter feed for show cattle. It's a very palatable feed with enough fiber to get the calves going. It helps expand the "gut" so that down the road, the calf has the capacity to consume enough feed "to do the job". To be fed as a sole grain along with the grass hay. Free choice mineral and clean fresh water should be made available at all times. Steam Flaked Corn, Steam Flaked Oats, Steam Flaked Barley, Cottonseed Hulls, Linseed Meal, Soybean Meal, Canola Meal, Wheat Middlings, Sunflower Meal, Corn Distillers Grains, Heat Processed Soybeans, Ground Corn Cobs, Salt, Calcium Carbonate, Sodium Bentonite, Monocalcium Phosphate, Dicalcium Phosphate, Cane Molasses, Ferrous Sulfate, Zinc Sulfate, Calcium Iodate, Cobalt Carbonate, Zinc Oxide, Manganous Oxide, Copper Sulfate, Ethylenediamine Dihydriodide, Sodium Selenite, Magnesium Oxide, Vitamin A Acetate, Vitamin D Supplement, Vitamin E Supplement, Menadione Dimethylpyrimidinol, Bisulfite (source of Vitamin K activity) Thiamine Mononitrate, Riboflavin, Calcium Pantothenate, Niacin, Vitamin B12 Supplement, Choline Chloride, Manganese Sulfate, Cobalt Sulfate, Dried Aspergillus Oryzae fermentation Extract, Potassium Chloride, Zinc Proteinate, Potassium Sulfate, Manganese Proteinate, Yeast Culture, Thiamine Hydrochloride, Copper Proteinate, Propionic Acid, Water, Ammonium Hydroxide, Sorbic Acid, Benzoic Acid, Phosphoric Acid, Propylparaben, Methylparaben and BHA.